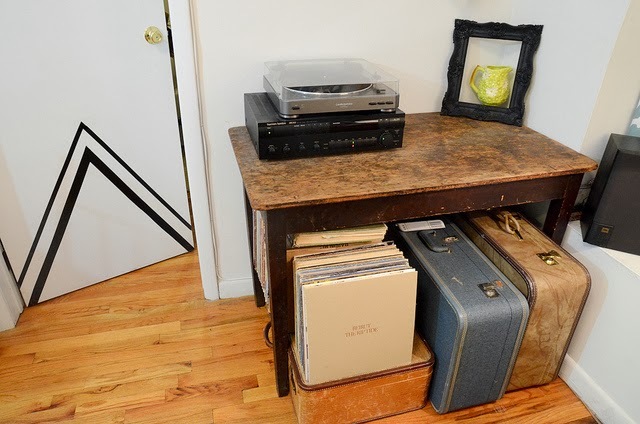 Stacie's turntable sits atop a perfectly worn antique table. 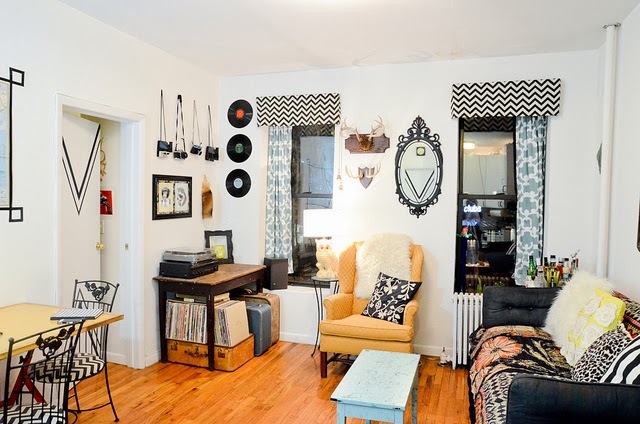 Underneath, vintage suitcases hold the records. Pops of buttery yellow and splashes of sky blue stand out amid the black and white color scheme – further picked up in the map hanging above the couch. Chevron, damask, striped, and floral patterns mingle among eclectic accents like vinyl records as wall art, an owl base lamp, and antlers. 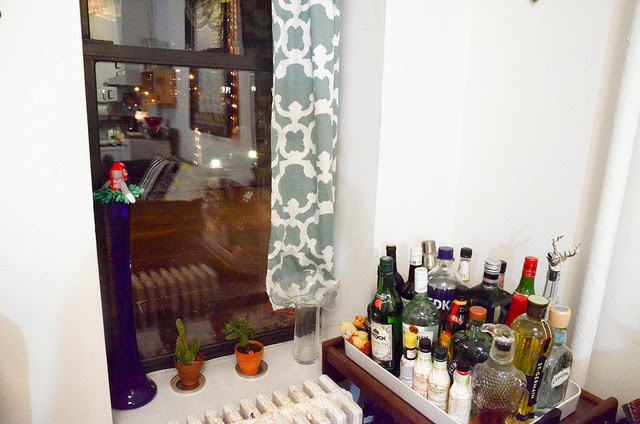 A fully stock bar tray takes up residence in the corner of the room – right next to a window with a view of those bright city lights. 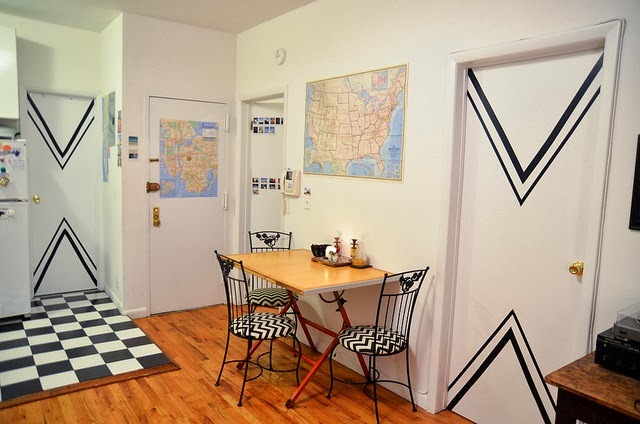 Black tape adds a simple but eye-catching graphic to the otherwise plain doors – picking up on the black and white checked kitchen floor and chevron upholstered dining chairs. 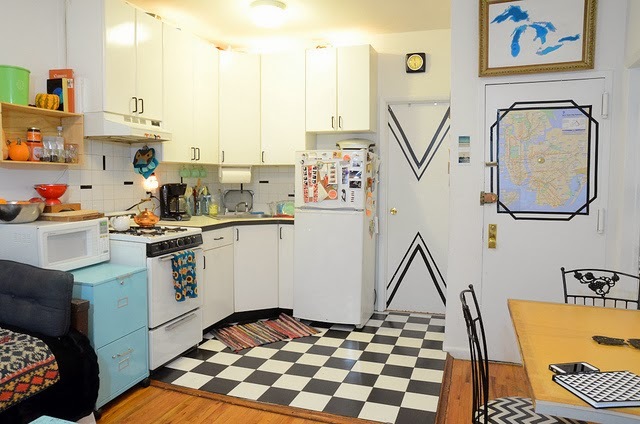 Black and white checks give off a vintage vibe in this cheery kitchen. With not much counter space to spare (oh, the woes of we renters) Stacie brought in a file cabinet painted pale blue. It's just the right height for a microwave cart – still leaving space above to store cutting boards and a bowl or two of fruit. More black tape frames the map on the entryway door. 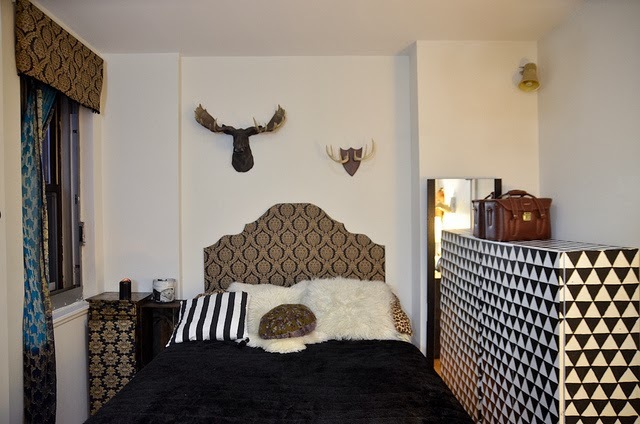 In her cozy, pattern-packed bedroom, damask, stripes, and a graphic triangle print live side by side with antlers on the wall and fur on the pillows. 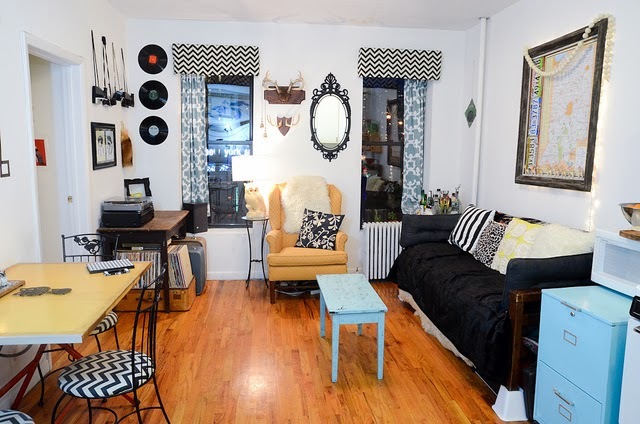 From fashion, photography, and hair tutorials to thrifting tips and diy projects, Stacie's blog Stars for Streetlights is full of inspiring ideas and additional photos of her ever-changing small space in the city. Head over to Stars for Streetlights or Stacie's flickr photostream for more inspiration now!